Protesters push and lift one of the fences surrounding the St. Louis Medium Security Institution. An inmate delivers a message from inside the Workhouse as protesters chant. Lamya Orr tries to greet a friend who is inside the workhouse from outside the gate. Protesters demand change as people inside the Workhouse live without air conditioning during an excessive heat warning. Police line up against the Workhouse fence to prevent protesters from shaking it. Activist Alicia Street blows a whistle while protesting conditions at the St. Louis Workhouse. Chris Phillips, a documentary filmmaker, lays on the ground after police sprayed chemicals into the crowd. Activists comfort a friend who was sprayed with a chemical agent. Two-year-old Kriss Rhodes looks toward the jail, where her father is, during the protest. People inside the Workhouse look out as protesters face off with St. Louis police officers. Friends and family of Isaiah Hammett join his mother, Gina Torres, to demand justice for the 21-year-old, who killed by St. Louis police in June. Updated July 24 at 2:15 p.m. information on arrests — Amid continued protests during this week's heat wave, St. Louis Mayor Lyda Krewson announced Saturday that the city is ordering portable air conditioning units to be installed "as soon as possible" at the Medium Security Institution. Inside the facility, which is also known as the Workhouse, many inmates are live in quarters without air conditioning as temperatures soar above 100 degrees. Krewson, who took office three months ago, emphasized that female inmates and those with health problems already stay in air-conditioned parts of the 51-year-old facility. "I support air conditioning ... for the health and safety of everyone who is in that jail," she said. Krewson also pointed to voters' rejection of a bond issue in August 2015 "that would have funded permanent air conditioning at the jail. " Meanwhile, civil rights activists protesting the conditions announced Saturday that a coalition of national organizations has joined fundraising efforts to bail out Workhouse inmates. The Arch City Defenders, a legal aid group, has already raised enough money to bail out 15 inmates. Thomas Harvey, the group's executive director, said in a statement Saturday that the goal in teaming up with additional organizations is to collect enough money to bail out dozens more. "Virtually every single person suffering in the Workhouse right now is innocent under the law yet being punished because of poverty," Harvey said. "... It's 102 today and there's no air conditioning. Shut it down." The national partners include Color of Change and the National Bail Out Fund Advisory Committee. More than 150 people gathered outside the facility Friday evening to protest conditions at there during this week's excessive heat warning. Heat index values are expected to reach between 110 and 115 degrees throughout the weekend. Friday's protesters included friends, family and supporters of those incarcerated as well as state Sen. Jamilah Nasheed, a St. Louis Democrat who recently met with Gov. Eric Greitens and urged him to investigate the conditions at the facility. Protesters beat pots and pans and chanted "no justice, no peace, freedom from heat!" A few of the protesters climbed underneath the facility's outer security fences. In response, St. Louis Police officers formed a line between protesters and the fence. As the evening wore on police moved protesters back from the fence with riot shields. Police also deployed a chemical agent to disperse protesters. After Friday night's protest, the mayor's office urged "citizens to remain calm." Protesters were gathered again on Saturday evening. Police arrested one person at the facility late Friday for trespassing and unlawful assembly. After protestors threw debris that night, one officer was treated at a hospital for an arm injury; another officer refused medical attention after sustaining a head injury, police said. On Saturday, authorities arrested three people for impeding traffic and failure to obey a police officer. Lamya Orr tries to greet a friend who is inside the Workhouse while standing outside the gate with his children and their mother. As temperatures climbed above 100 on Friday afternoon, organizers on the fifth floor of a St. Louis church hurried to stuff envelopes full of cash. Using black markers, they wrote the names of inmates awaiting trial, their birth dates, and the cost of their bonds. The Arch City Defenders, a legal aid group, and the St. Louis Action Council have raised about $10,000 to bail out 15 low-level offenders from the city’s Medium Security Institution — known as the Workhouse. Temperatures inside the aging building are usually 5 to 10 degrees warmer than it is outside because much of the facility does not have air conditioning. The temperature Friday reached 102 degrees by 4:30 p.m. Volunteers chose the inmates from a list of people identified by concerned family members, with names entered into a spreadsheet. They also paid overdue fines from nearby municipalities, to prevent people from being moved to another jail if they faced arrest warrants from other jurisdictions. Many of the donations were online contributions, but the campaign also received assistance from a national bailout fund. Activists hope to continue raising money to bail out another five inmates by the end of the weekend. The jail's total daily population is about 700. On Friday, city officials met with a vendor to negotiate a contract for the installation of temporary cooling units, which could go in as soon as next week. "I haven't seen a signed contract, but I'm pretty sure they will," said Tom Shepard, chief of staff for the president of the St. Louis Board of Aldermen, Lewis Reed. Koran Addo, spokesman for St. Louis Mayor Lyda Krewson, said corrections officials are doing what they can to keep inmates safe, such as rotating them through air-conditioned areas and distributing water and ice. He added that the city supports the activists’ efforts to bail out inmates at the facility. Addo noted that a bond issue to improve city infrastructure that failed to win voter approval in 2015 could have paid for cooling at the jail. A 2014 list of line items for the bond that was distributed to the Board of Aldermen did not appear to allocate funds for air conditioning. It did propose upgrades to ventilation fans and heating. Protesters are planning a demonstration outside the north St. Louis jail Friday evening. An excessive heat warning remains in effect until Saturday night. Updated at 4:40 p.m. with state representative's request — Activists say this week’s near-record heat is dangerous for inmates at St. Louis’ Medium Security Institution and is one more reason the jail needs to be shut down. The majority of the 700 inmates at the jail, also known as the Workhouse, live in portions that don’t have air conditioning, St. Louis corrections commissioner Dale Glass said. Temperatures are routinely 5 to 10 degrees warmer inside the 51-year-old building than outside; activists allege that’s another violation of inmates’ rights. 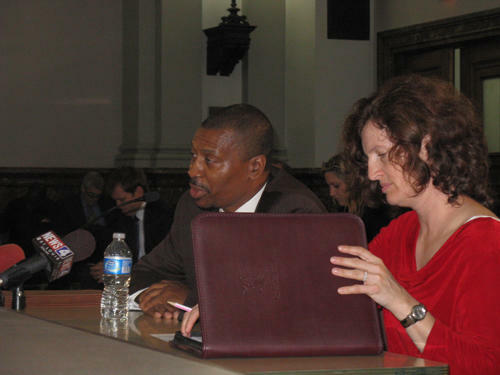 Legislation that would give St. Louis a clearer picture of who's being held in solitary confinement in the city's two jails will be introduced Thursday at the Board of Aldermen. Joe Vacarro, D-23rd Ward, said he saw the need for more information about the inmate population while campaigning for sheriff this year. The fate of the city of St. Louis 's former corrections commissioner is now in the hands of Judge Robert Dierker.